In this post we will go over everything you need to know to run your first web automation tests with Selenium 3. Currently you can run Selenium tests in all major browsers like Chrome, Firefox, Safari, Internet Explorer, Edge and Opera. With a little more effort you can even test mobile browsers like Safari on iOS and Chrome on Android but the setup for this is a little more complicated and will be topic of a future post. Now that we know how powerful Selenium is let us take a look at what you need to do in order to run a first simple test case. The below example will show all steps to setup Selenium on Windows and Firefox, Chrome, Edge and Internet Explorer but the process is the same for any operating system and supported browser. 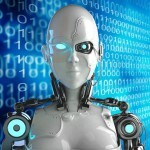 Now you are all set to create your first test case. In this example we will be using C# to create our tests but the process is similar for every other programming language. To run any Selenium test in C# and Visual Studio you need to create a new Testing Project and add references to the Selenium language bindings to your project. The language bindings can be found on the Selenium homepage or in case of C# as a nuget package (Selenium.Webdriver and Selenium.Support). If you run this test you will see the Firefox window executing the steps above. While this test works it is really not browser independent as the first line creates an object called FirefoxDriver which cannot be used to run the test in other browsers. So let us modify the code to run a separate test case for Firefox, Chrome, Internet Explorer and Edge. Running this will execute the test case in all 4 browsers. 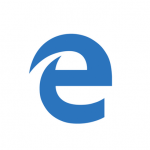 If you are running a 64 bit version of Windows you might notice that Internet Explorer executes the test much slower than the other browsers. For this reason it is recommend that you always use 32 bit version of Windows / Internet Explorer to run Selenium tests in Internet Explorer. Not bad so far. But what do you do if you need to run the tests against browsers that are not available on your local machine? You use Selenium Grid! Selenium Grid works a little bit different than executing tests on the local machine. While you can use the same testing code to execute tests against a Selenium Grid you will need to use the RemoteDriver instead of the browser specific drivers like FirefoxDriver or ChromeDriver. This remote driver will execute the tests against a Selenium Hub which automatically delegates the test execution to one or more Selenium Nodes. These Selenium Nodes can support different browsers and can be run on different operating systems so that you can execute tests against browsers on Windows, macOS and Linux with the same testing code. 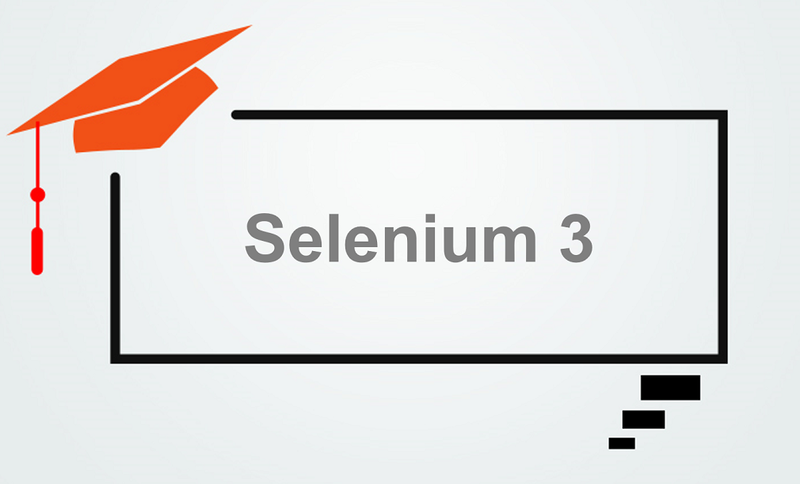 Running a Selenium Hub is quite simple, all you need to do is follow these 4 steps. Now a Selenium Hub without any Nodes is not that useful so we will need to setup at least one Selenium Node. Keep in mind that the Hub and Node can run on different machines. In the node configuration file you can specify which browsers the node is able to execute tests in. This will tell the hub which tests it can execute on a given node. To run the above test against the Selenium Grid we only need to change the driver object all the other test code will stay exactly the same. This test case will execute against the Selenium Grid. Of course you need to modify the URL if your Grid runs on a separate machine. To run the test against a different browsers simply change the capabilities object as necessary. 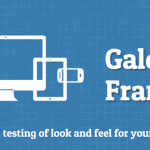 As you have seen a Selenium Grid can be a powerful asset to your automated web testing. But unfortunately it is quite a task to setup if you need to test against different operating systems and different versions of Internet Explorer. Multiple machines, different driver version and keeping everything up to date is quite a task. Because of this we have integrated a Selenium Grid in our cross browser testing solution BrowseEmAll (14-day free trial) to simplify this process. To start a Selenium Grid with BrowseEmAll all you need to do is switch to the Selenium tab, select the browsers you want in your Grid and hit the Start button. 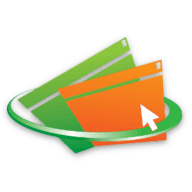 BrowseEmAll will automatically create and start virtual machines as necessary to execute your tests in all selected browsers. Of course everything runs directly on your local machine! And the best part? 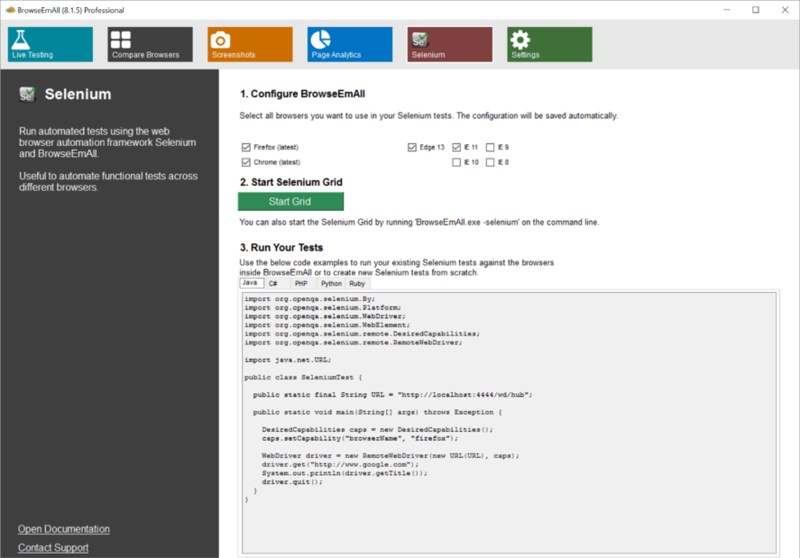 You don’t need to change any of your test code to run your Selenium tests against the BrowseEmAll Grid. Just use the Remote driver as shown above and you will be all set. Sounds good? Give it a try or request a custom demo to learn more.